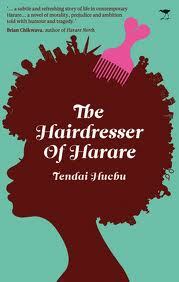 I didn't know what to expect when I started reading The Hairdresser of Harare. From the synopsis I knew it was about two hairdressers in Harare - Vimbai, a seasoned pro and possibly the best hairdresser in Harare and Dumisani, a new-comer to the salon who is as charming as he is handsome. That is all I knew. But I did love the premise of the book. In Africa (well I won't generalise as I do not know about the rest of Africa), so I rephrase, in Nigeria hairdressing is seen as female profession but I know that male hairdressers are not uncommon and I loved that this was a book looking at a male hairdresser (I am interested in the concept of men doing 'women's work' and what this says about socially constructed gender roles and expectations). Vimbai initially dislikes Dumi as he becomes the top dog at Mrs Khumalo's Hair Salon, but with time she starts to warm up to him when he becomes a tenant in her house. Friendship, and then love blossoms. But underneath it all, Dumi has a deep dark secret. Can I be honest, I kind of had a suspicion of what Dumi's secret was very early on in the book - and no, him being a hairdresser isn't what gave it away. Tendai Huchu actually dropped very subtle hints throughout the book which I picked up. Even though I had my suspicions, I still loved the build up to the reveal. I loved the way Tendai Huchu portrayed the Zimbabwean society - the elites, the hyperinflation, the covert tactics people adopted to gain access to food - but most important the way he tackled the issue of homosexuality. Zimbabwe is known to be an extremely homophobic society (as is much of sub-Saharan Africa). This is a country where Robert Mugabe said that homosexuals were 'worse than pigs and dogs', and here is a book writing about homosexuality. I didn't particularly like Vimbai's character, as the book went on I began to warm up to her, but that changed again when I was confronted with her prejudice towards homosexuality and the way she initially handled it. Dumi, on the other hand, I loved. I also felt his plight - to live in a society where you have to hide who you are must be heartbreaking. This is a really quick read and I would recommend to anyone interested in a book that looks at modern-day Zimbabwe and the issue of homosexuality. I loved this too (though wish I had gone into it NOT knowing ahead of time about Dumi!). Great review, and I can't wait to see more books like this. I am so glad I didn't know what it was about - made figuring it out all the more fun. It makes me proud that we have authors that aren't afraid to tackle the taboo subject of homosexuality in Africa. Great post of book review. Thank you! Glad you liked the review. Love your site - so good to have a place to find out about good books from/about the continent. And thanks for the reviews. Can I suggest that they would be even more helpful if they didn't give away important plot lines; half of the fun of reading a good book is the twist and turns. I find myself much less eager to read this book after finding out the big secret. Thanks again for the site, and keep doing what you do - it's appreciated. I am so glad you love the blog. It makes me truly happy to when I hear such things. I have to say, I actually am the same (you probably won't be able to tell from this particular review) but I usually do not give too much of the plot (as I myself enjoy going into novels "blind"). Unfortunately, with this novel I personally didn't feel it was right to write a review without mentioning that it tackled homosexuality (especially as homosexuality is usually negatively portrayed in African societies). It still is a really great read, and there is more to the novel than just the 'big secret'. There are good points in which we can get from the reviews you have here. Glad to visit here again.